Description: Castel Beseno is an impressive fortress occupying the top of a whole hill, in a dominant position over the Adige Valley. The castle can be reached from Besenello, halfway through Trento and Rovereto, and is now the venue of cultural events and historical reenactments. 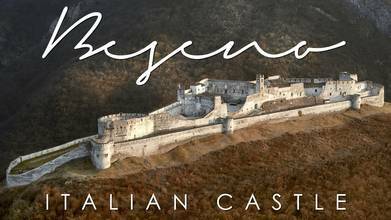 The great bastions that characterize Castel Beseno date back to the 16th century, when the castle was adapted for battles involving the use of fire arms. Today, in addition to the courtyards and buildings of the fortress, once used as kitchens, bread ovens, cellars and storage rooms, it is also possible to visit and walk along the parapet walk, with panoramic views of the Val d’Adige and the valley leading to the Altopiano di Folgaria plateau. Also on display is a collection of original or true copies of weapons, all meant to be touched: everyone is invited to wear and handle helmets and mail armour, to the delight of children (and their dads)! Many historical battles took place in this fortress - i.e. the 1487 battle between Trentino troops and the Venetians, as well as the armed battles between the French revolutionists and the Austrians in the two world wars-. In 1973 the Trapp counts donated the Beseno castle to the Autonomous Province of Trento which carried out extensive re-construction works. It is the largest fortified complex in Trentino and today a most fascinating showcase for exhibitions and shows. Besides its grandeur this castle captures the visitors' attention because of its evocative and fascinating atmosphere. Temporary exhibitions, cultural events and period costume pageants are held here, in the exceptional scenario of the vast Campo dei Tornei (Tournament Field) which is currently a well-groomed garden. Many historical battles, from the wars between fractions with the Veronesi in the 12th and 13th centuries to the battle of 1487 between Trentino troops and the Venetians, as well as the armed battles between the French revolutionists and the Austrians in the two world wars, took place in this fortress. In 1973 the Trapp counts donated Castel Beseno to the Autonomous Province of Trento which carried out extensive re-construction works. The large lunated ramparts distinguishing Castel Beseno go back to the 16th century. The main doorway had a drawbridge and when entering the castle you can still see three gunports in the first courtyard. In the large square the gunpowder deposit house now holds a room for visitor information and audiovisual projections. To the side you can see the clock tower and the hayloft. Beyond the central part of the Castle you reach the castle dwellers' residence. The feudal complex originally was made up by three turreted nuclei on the two extreme rises of the hill. The Casa del Vescovo (House of the Bishop) and Palazzo nuovo (New Palace) are located in the third nucleus. Besenello benefits from its sunny location and its mild climate and is surrounded by fruit orchards and vineyards. Besenello offers a wide variety of possibilities regarding excursion destinations for mountain biking or hiking, such as the Sentiero dell’Imperatore path, once established for military reasons. This trail leads from Acquaviva to the Santa Trinità church. Particularly impressive, however, is the abyss on the right side of the church oriented towards Rio Secco. The area enjoys a particularly mild climate which is ideal for producing fruit and wine, among which Moscato Giallo, the aromatic white wine par excellence of the Alta Vallagarina, the vineyards of which can be seen in the area around the hill of Castel Beseno. - Footage filmed with DJI Inspire 2 (ProRes RAW) -Camera: Zenmuse X7 + 50mm no ND Filter - Filming time: approx. 15 minutes (6 battery set) - Editing time: approx. 2 hours - Editing software: FCPX (Final Cut Pro X by Apple) - Music Licensed By: Artlist - Title: Guardian Angel by Ian Post (Made in Europe) - Wind: Very Strong!